I was just recently looking into some of the details of the different crystal structures that ice can freeze in. I was aware that many of the unusual properties of ice $I_h$ (the structure of “everyday ice”) are a result of the proton disorder necessary for the hydrogen-bonding arrangement it adopts. What I also found is there are other arrangements of ice which are proton ordered and have nearly identical density to ice $I_h$. Now, I know density has no predictive value on what crystal structure will be taken (rather crystal structure can be used to predict density), but it seems unusual to me that there is such massive divide between ice $I_h$ and the rest of the ice srystal structures. Is the entropic gain of proton disorder an explanation why ice freezes the way it does? Also, is there a large energy minimization associated with the hexagonal lattice that ice $I_h$ takes on? Doesn't it seem like a proton-ordered arrangement would be preferable over a proton-disordered arrangement? Or is it all much more complicated than that? It just seems like there should be a crystal structure of ice which is comparable to ice $I_h$ in energy, stability, etc. and yet there isn't. I suppose a true answer to this question, because I admit it's rather broad, would deal with why the hexagonal lattice is so much more preferable for water than some other lattice arrangement. By dealing strictly with water, rather than crystals in general, I believe an answer to this question is more within reach. Thus, the proton ordering is energetically favored over proton disorder, while proton disorder is entropically favored. Following simple combinatorial arguments [G. P. Johari, J. Chem. Phys., 109, 9543 (1998)], one can estimate the entropy difference at $R \log(3/2) \approx 3.37$ J/mol/K. From the transition temperature of $T_0 = 72$ K, one can then work out the enthalpy difference at $\Delta H = -T \Delta S \approx -0.243$ kJ/mol. We can note that both terms are very small. The hexagonal arrangement is not the only one accessible: there is a metastable cubic ice ($I_c$) phase accessible at ambient pressure. The enthalpy differences between cubic and hexagonal ices are even smaller than with ice XI, of the order of 40 J/mol. 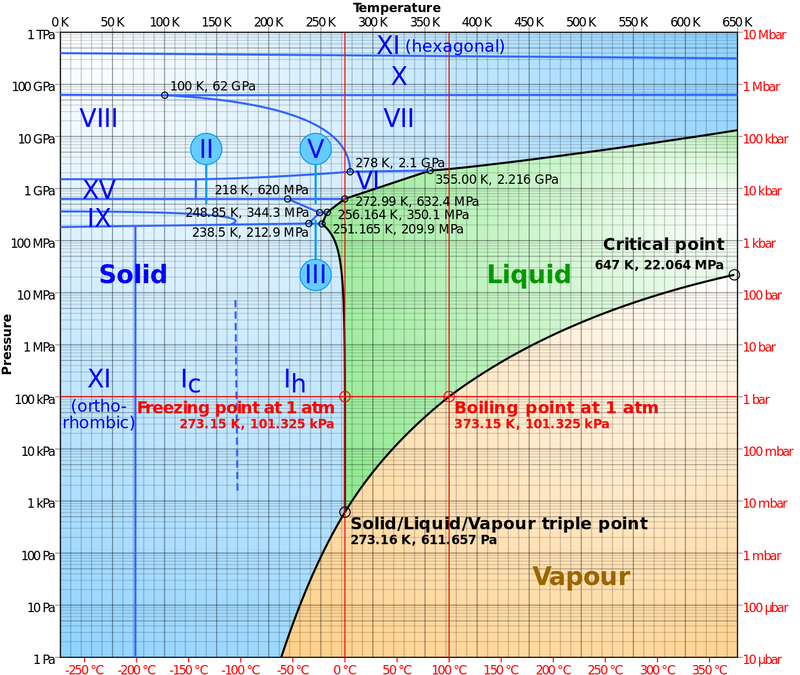 There are, finally, numerous other phases of ice — some experimental, some hypothetical — at positive or negative pressures. Since their boundaries are almost horizontal on the phase diagram, it implies that these transitions are dominantly density-driven. There are also amorphous ices! To your final question: why ice prefers the hexagonal net? Well, in order to form low-energy crystalline structures, water must adopt a tetrahedral / four-fold coordination, with each molecule surrounded by four nearest neighbors: two on the donating end of hydrogen bonds, two on the receiving end. So the question is: how many periodic structures (crystals) are mathematically possible with this arrangement? They are called four-connected nets, and there are an infinite number of those. However, it happens that among those with relatively low density and “simplicity” (i.e. relatively few inequivalent vertices), most are of high symmetry, including hexagonal. There is actually an interesting parallel between ice structures and another category of solids having four-connected nets: silicas. Not the answer you're looking for? Browse other questions tagged water crystal-structure or ask your own question. What makes water a liquid (when it is)? Why doesn't a table sublimate, while ice does? Can alloys or ceramics have higher density than elemental solids?